The FaceBlade Travel Kit is designed for the non-headshaver and comes in a suitcase that is so cool you may want to put in some flight vouchers and a passport. See, this kit contains all the essentials for a non-headshaver to be part of the family. The FaceBlade travel razor is designed for the face (duh!) or legs, or anywhere else (other than your head) you shave. Since this is a travel kit we've included a nice TravelShell and our line up of creams, which include our wildly famous HeadSlick shave cream, HeadShed exfoliator, and one each of HeadLube Glossy and HeadLube Matte. The creams come in convenient travel ready 2 oz. bottles and a nice zippered travel bag. Bon Voyage!!! 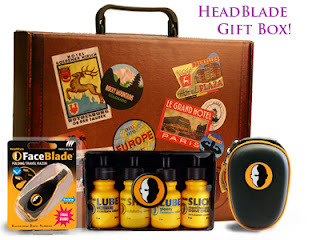 Buy it here: http://www.headblade.com/travelkit. Cost, $28 bucks.